You may be just joining us from Zoe Tant's beautiful blog - wasn't Zoe's project just gorgeous? I love that the project is so simple and effective! Let's hope you get inspired with all of the projects we have to share. The font of the sentiment stamp set from the Thankful Thoughts set complements the style of the flower stamp perfectly. Now you know that I can't just keep things totally simple so I stepped up this design by layering the stamped image on the front (not quite keeping to brief), it's still simple stamping but with an added layer. . . I simply centred the stamped image and left out the sentiment. I stamped on Whisper White Card Stock and mounted the rectangle on a slightly larger rectangle of Basic Black Card Stock. All card bases in this instance are the Note Cards available in the Annual Catalogue. Because of the clean outlines this stamp set lends itself to so many techniques - colouring, paper piercing and so much more. . . which lead me to the next idea. . . stepping the card design up a little. Imagine if we stamped on DSP? And I love the wood grain pattern in the Festive Farmhouse Designer Series Paper pack in the Holiday Mini Catalogue which is only available for a few more days. . . Stamping directly onto DSP is a brilliant way to add a bit more pizzazz to a project without complicating things too much. Again the only change I have made to this project is to stamp directly onto the Festive Farmhouse DSP in Memento Ink. The DSP is mounted directly onto the Note Card. I love the look of the white washed wood grain through the stamped image. Very simple stamping. . . So imagine if we were to add a touch of colour. . .
For this card (again using a Note Card and the Festive Farmhouse DSP) I stamped in Memento Ink and coloured the flower buds with the Dark Mango Melody Blend and the leaves with Light Granny Apple Green Blend. The open flowers have been stamped using the small stipple stamp from the Touch of Textures Stamp Set in Lovely Lipstick ink. I added three Pearl Jewels for a touch of glam! The Mango Melody Blends (147945) are only available in the Holiday Mini Catalogue so don't miss out. You can see that the Lovely Lipstick stamping is not even "inside the lines" - but the effect is awesome and it is still a very simply stamped card. . . Check out the next evolution. . . I love colouring in and there is nothing simpler than colouring in a nice clean stamped image. This image is stamped in Memento Ink and coloured using Light Lovely Lipstick, Light and Dark Flirty Flamingo, Light Granny Apple Green and Light and Dark Sea Foam Blends. The stamped image is mounted on a Basic Black Card background on the Note Card. There is nothing more satisfying than colouring in and with the blends it is a simple stamping project with a touch of colour! I know - I am a rule breaker . . . but this stamped image was calling out for some love. . . I wanted to show you that you could stamp with just one colour and one stamp set and make some beautiful projects - this card involves masking with a post-it note and moving the stamp a little each time you stamp to change the appearance of the stamped image. For this card I simple covered the stamped image with a post-it note and stamped the next image on a 25 degree angle at say 2 o'clock over the masked stamped image. I stamped three times in total. Very effective and still simple stamping but with a simple technique thrown in! Now what would happen if we added a touch of colour to an image stamped like this? Well I had to try it out. . . I coloured the flowers with Coastal Cabana ink and an aqua painter, the flower centres were coloured with a Dark Lovely Lipstick Blend pen and the leaves with the Light Granny Apple Green Blend pen. For an added touch of difference I stamped the main flowers in the image three more times, coloured them with the same ink, fussy cut them out and stuck them on top on the flowers with TomBow Glue. I would argue that it is still simple stamping with a little effort invested. . . Here's another example of simple stamping. . . Because I had the aqua painter and the Lovely Lipstick ink pad and Blend pen on the table. . . I thought, why not add some popping pink to the equation? The biggest impact here is the background - I painted the background with a clean wet aqua painter, spreading water to wet the card stock without adding any ink (this means the ink application goes mores smoothly). I then loaded the aqua painter with ink from the Lovely Lipstick Ink Pad and washed it over the background. I splattered the excess ink residue from the aqua painter by tapping it on a bone folder over the card. I cleaned out the aqua painter then splattered some more spots of clean water on the background for good measure. This is the same stamp masked once and stamped twice in Memento ink. The stippled centres are stamped in Lovely Lipstick and the buds coloured using the Lovely Lipstick Blend pens. I also stamped the larger stippled stamp from the Touch of Textures stamp set in Crumb Cake. The pearl jewels are added to break up the colour a bit. 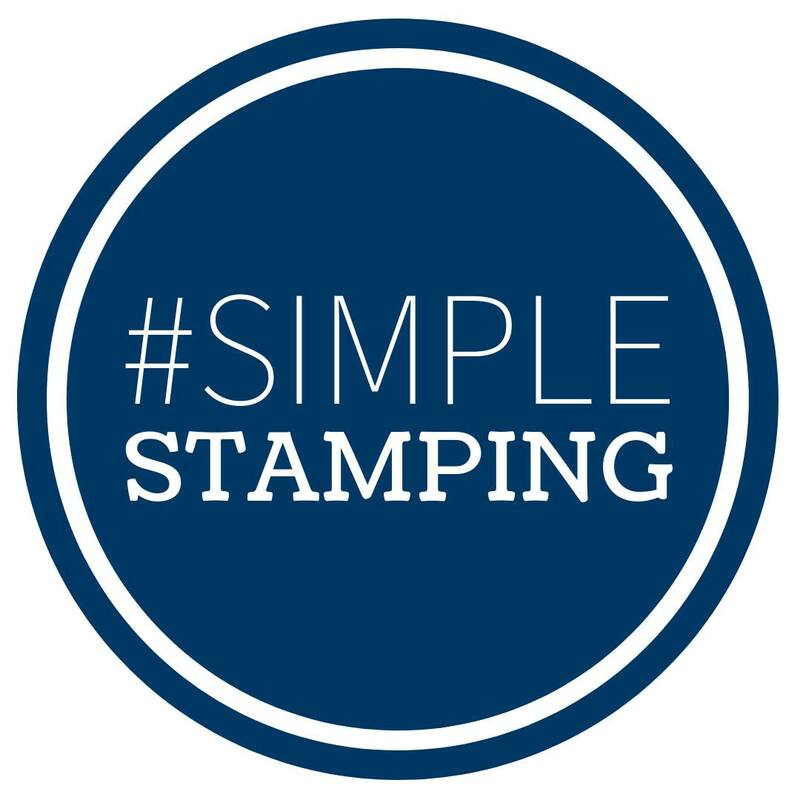 . .
Keeping with the simple stamping theme I thought it important to show how to stamp using the Stamping' Write Markers as the method or tool for inking up a stamp to provide a simple stamped image. I inked up the stamp with the Real Red and the Mossy Meadow Stamping' Write Markers using the brush nib. I then coloured the image using an aqua painter and simple leaving the colour from the stamped outline into the void of the stamped image. The image is inked and stamped the same way as the card above, the only difference is the background which I created using the "D" size Clear Stamping Block inked with the Soft Sea Foam ink pad and stamped over the coloured stamped image. This is great way to get more value from your clear stamping blocks and is a neat background for all types of projects. I think this is the best type of simple stamping. . . So ten Note Cards in the pack, and ten different simple stamping projects using the one main stamp set and a few different coloured ink pads, blend pens, Stamping' Write Markers and tools. . . I know that everyone could replicate these projects really easily! I hope you are feeling inspired to give simple stamping a try. Don't leave us just yet because there is a fabulous project on Barbara Meyer's blog, Barbara always blows my mind with her amazing creativity! I love her project this month and am sure that you will too. 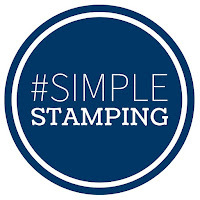 I hope that you all embrace #simplestamping and that you share your projects with others. Hello Everyone - welcome to our December Blog Hop with the Fancy Folds International Design Team - you have possibly just hopped by from Satomi's blog, wasn't her project awesome! So cute! I followed Beth's Paper Cuts YouTube tutorial which was really simple and easy to understand. For something different I stamped on DSP and used the Snow is Glistening promotional stamp set from last month's sale. I stamped in Tranquil Tide, Mint Macaron and Soft Seafoam. The sentiments are from Beautiful Blizzard, stamped in Tuxedo Black Memento Ink. My base card is Whisper White. I matted the back and the front of the card using the green glimmer paper from the Joyous Noel Glimmer Paper pack and Tranquil Tide Card Stock. The DSP feature on the front is the bleached timber from the Festive Farmhouse Designer Series Paper Pack (I love this DSP pack as the designs and patterns are so versatile). The green Glimmer Paper really makes the stamped images pop. I used the Layering Squares Framelits to cut the square shapes for the Flip Flap feature. The top feature is three layers and the hidden feature is two layers - they are quite sturdy and move smoothly with the pull mechanism. I used Tranquil Tide Velvet Ribbon from the Holiday Catalogue and secured it with the Silver Metallic Thread. I made the second scoring line a little closer than the one in the YouTube Tutorial - I just wanted it to sit a little more flush. As you can see the flip flap mechanism is really neat. The combination of three green tones is very subtle and the card is delicate despite using the dark glimmer paper and card stock. The contrast with the timber grain gives the whole project a Christmas winter feel. The ironic part is that where I live in Australia we are in the midst of a heat wave and have a hurricane re-forming and making a u-turn to come back and hit us for the second time in a week! So snow is the furthest thing from my mind lol. The Scalloped Tag Topper and the Classic Label Punches are ingenious in this project and make the whole process so easy. I decorated the inside to marry with the overall theme. I think it finishes it nicely! Hopefully you have been inspired by the hop so far and by my Christmas project - there is still time to grab a bargain on our clear out sale and still time to get your creativity fired up before Christmas day! Don't leave us just yet! Nadine Schweda has a beautiful project to share and she has some great tips too! Welcome back this month we are sharing the Polished Stone Technique, you may have just popped by from Zoe's amazing project! I wanted the polished stone technique to feature and have chosen to add stamped images using the Lovely Lattice Sale-a-Bration stamp set. This is an avid stamper project although it is really quite simple. It's a square card - the base card is Powder Pink mounted with Whisper White squares on the front and inside. The technique is done on a square of Glossy White card stock and the stamped images are on a separate piece of Whisper White (fussy cut and layered). The polished stone technique was done using Bermuda Bay and Pool Party re inkers, Isocol Rubbing Alcohol and cotton pads. I was patient and allowed the inks to dry before employing the gloss card in the project. The floral image was stamped on Whisper White using Tuxedo Black Memento Ink. I coloured the images using - Light Bermuda Bay, Light and Dark Petal Pink, Light and Dark Cherry Cobbler and Light and Dark Old Olive Stampin' Blends. I stamped out the large flower three times and fussy cut two of the images after colouring them. I stretched out the flowers using the bone folder, curling the petals upwards and into the centre of the image. For the first layer I also cut between each petal to allow each to forma separate shaped. The very centre of the flower is just one piece. Once I had cut out the stamped image I layered it onto a piece of Copper Foil Sheet which I cut using the scalloped Layered Oval Thinly. Added housing in Copper Metallic thread behind the ovals and dimensionalised the ovals. You will see that I also stamped and coloured five smaller flowers from the Lovely Lattice set and curled them little too once I had cut them out, I wanted the flowers to feel like they had been scattered at the top. As always I like to dimensionalise my cards and give them a lot of layers. Here is a side view. The colours truly compliment the copper foil and bright Bermuda Bay background. I wanted the polished stone technique to meld well with the project and not be outshone and I hope that I have found that difficult balance. I think that this stamp set is going to be extraordinarily popular for every level of stamper because the beautiful fine line of the images lends itself to colouring an simplistic monochromatic stamping too. . . stay tuned as I feature this set over the coming weeks. Building flowers is easy and makes a massive impact. The sentiment is from the Incredible Like You stamp set which will be released in the Occasions Mini due out in early January. I stamped in Bermuda Bay on Whisper White and punched it out with the Everyday Label. I hope you have found some inspiration in my project today and that you feel inclined to give this technique a go. It is great for cards and scrap booking alike and will be a great background or stamping feature on all types of projects. Don't leave us just yet as we have so many other projects to share. Nadine Weiner is next with an awesome project! Welcome back to another blog hop with the zany team from Totally Techniques. This month we are doing Cracked Glass technique. You may have just popped over from Kelly's blog - wasn't her project just incredible? I followed Beate Johns' YouTube tutorial which was really simple step by step instructions. I have used glimmer paper features on the front and inside the card (which is mounted on a strip of Early Espresso Card Stock) - I chose the copper tone from Joyous Noel pack in the Holiday Cattie. I used the stamps and sentiments from the Country Home stamp set, cut out the stamped image with the Layering Ovals Framelits and mounted it on two of the scalloped ovals from the same set in Early Espresso Card Stock. All images have been stamped in Tuxedo Black Memento Ink. The timber elements are from Frames Elements - I stamped the darling label-style wooden elements with the filigree stamp from Timeless Textures in Early Espresso ink. The leaves from the Frames Elements were coloured using the Dark Cherry Cobbler and Dark Old Olive Stampin' Blends. I stuck these together with the three leaf copper element from Leaves Trinkets, I added the linen thread tied in a bow and dimensionalised the embellishment. I coloured some Pearl Jewels with the Dark Cherry Cobbler Stampin' Blend to marry them in with the stamped image feature. The actual cracked glass over the coloured stamped image was achieved by first stamping the whole oval with Versamark then heat embossing with Clear Stampin' Emboss Powder. I did about six (6) layers and simply dipped the oval back into the embossing powder before the project cooled down. I left it to dry for about 15 minutes then folded it in on itself - this cracked the gloss coating and gave the image a crazed cracked appearance. To enhance the cracks slightly I sponges some Early Espresso ink across the front of the glass coating. I hope you have found some inspiration. Thanks so much for stopping by. Don't leave us just yet though as Barbara Meyer has the most beautiful project to share! Until next month, stay glittery!